Flag football is quickly becoming a popular alternative to its more traditional counterpart. Players young and older, amateur and pro, are starting to play this fast-paced, former schoolyard game while tackle football is dealing with rule changes intended to make it safer. Organized flag football leagues are surfacing throughout the country, with hundreds of thousands now enjoying the game. There are leagues for fun and leagues where players can cash in—one tournament offers a $1 million team prize. Top organizations staging events include National Flag Football (NFF), the American Flag Football League (AFFL), Football ‘N’ America (FNA) and the National Intramural and Recreational Sports Association (NIRSA). USA Football, the sport’s national governing body, organizes events of its own. Most leagues rely on corporate and individual sponsors along with registration fees to pay the bills. “Not only is flag football safe, fun and affordable, it helps athletes develop hand-eye coordination and allows them to play football without the contact of tackle,” said Francis Meram, executive director of NFF, which began in 2006 in two locations and now offers competition in 110 cities across 12 states. “Parents love it. They love the fast pace, competition and excitement of the game. 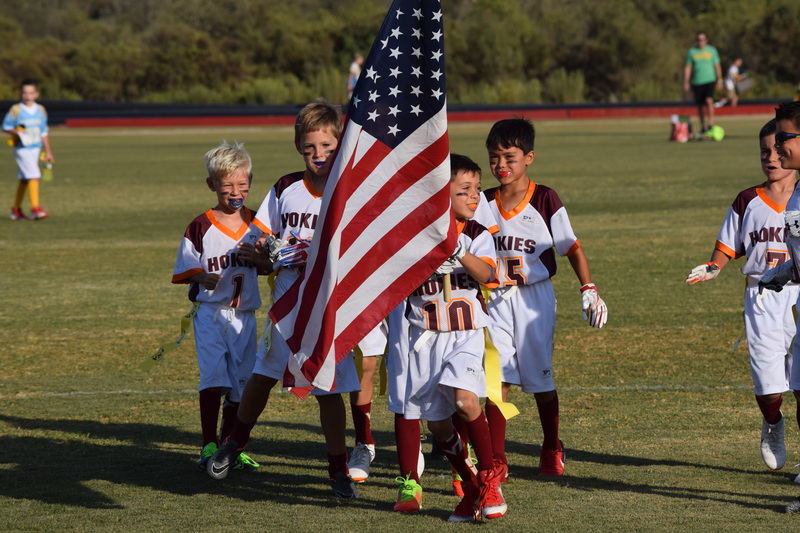 Youth organizations are doing their part to increase flag football participation across the United States. According to a 2018 New York Times report, the number of 6- to 12-year-olds playing flag football over the past three years has increased by 38 percent, to more than 1.5 million. That’s 100,000 more than the number of youth playing tackle football, according to the Sports & Fitness Industry Association. Rules and formats vary from league to league. Most do not permit blocking or tackling. Flags are attached by Velcro or ball-and-socket, although some leagues have adopted high-tech, lighted belts for easier officiating. Players generally play both offense and defense. Some organizations use 100-yard fields, while others play on shorter fields depending on player age and skill level. Another organization experiencing growth is NFL Flag, run by USA Football, which considers itself the largest flag football program in the country. More than 450,000 youth ages 5–17 play in programs endorsed by the league. The program offers regional tournaments as well as national championships played in conjunction with the NFL Pro Bowl. For the series, USA Football organized 12 regional tournaments in NFL markets that were chosen by the NFL. Youth teams qualified for the national tournament at those regional events, and another 21 teams ages 13 and 14 were nominated by NFL teams to compete at the championships in Orlando. In total, more than 70 teams from 24 states competed at the championships. To attract more participants, NFL Flag partners with other organizations. Last summer, the league joined Boys & Girls Clubs of America to launch a program for more than 100,000 youth ages 6–18. For this initiative, the NFL is supplying annual grants to 400 clubs as well as game equipment and training for officials and coaches. USA Football has also partnered with Atlanta Public Schools to offer flag football to seventh- and eighth-grade girls for the 2019–2020 academic year. In addition, Gwinnett County (Georgia) Public Schools became the state’s first school district to sponsor an all-girls high school flag football this past season. In total, 19 teams were fielded with rosters of 20 or more players. The district received support from USA Football, ESPN and the NFL’s Atlanta Falcons in the effort. The rapid growth of flag football has created many opportunities for cities and venues seeking to host tournaments and other competitions. 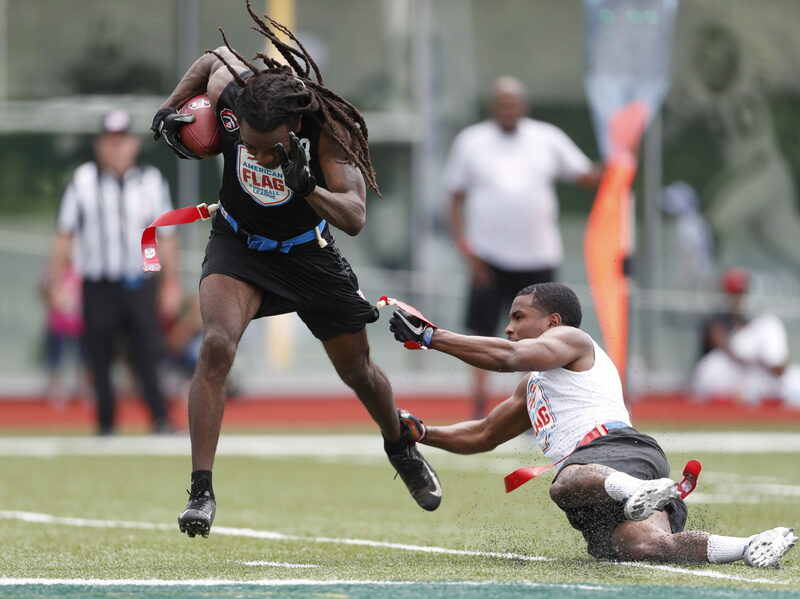 National Flag Football, based in Bloomfield Hills, Michigan, intends to organize 34 tour stops and an annual national championship this season, with competition in cities including Atlanta, Pittsburgh and Miami. NFF also hosts an annual Summer Nationals for ages 6–17—most recently held last July at the Pro Football Hall of Fame in Canton, Ohio—and a National Championship each January. NIRSA, the Corvallis, Oregon-based organization that oversees collegiate recreation programs, is not a newcomer to flag football. The organization published its first rulebook in 1983 and has held its own National Flag Football Championships since the 2006 season. Since 2013 the University of West Florida in Pensacola has hosted NIRSA’s season-ending event each winter. In January 2020, NIRSA will move the tournament to Round Rock, Texas. The city has signed on to host the event through 2022. “We have a bid process, and we encourage sport commissions or cities to partner with our institutional members,” said Valerie McCutchan, NIRSA director of national sports programs, who noted that more than 650 universities are members. “Round Rock was selected to host since they have a state-of-the-art (60-acre, 10-field) multipurpose complex, an incredible staff and the many outstanding amenities around the Round Rock area.” The event will be up for bid again in 2021. 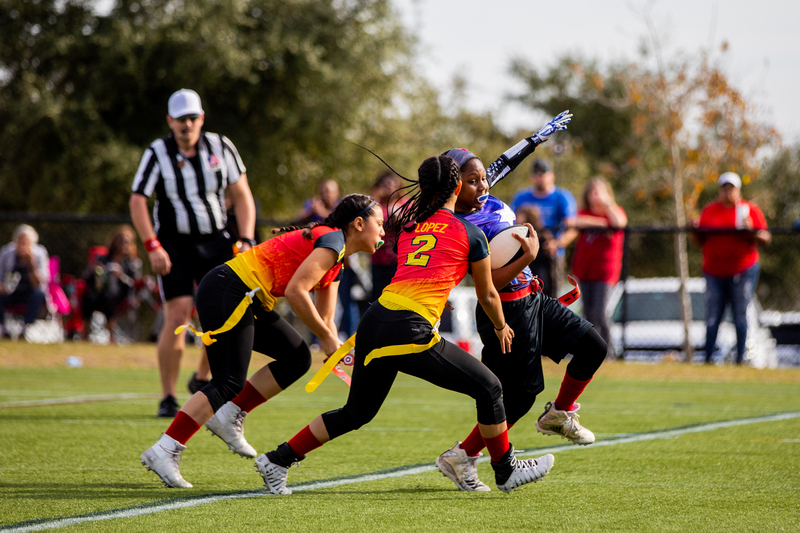 Another major player in flag football tournaments is the Flag Football World Championship Tour, an alliance that hosts and promotes worldwide competitions with divisions for all skill levels. The 2019 FFWCT World Championships are slated for May 24–26 in Arlington, Texas, with $60,000 in prize money available. Overall the FFWCT features hundreds of teams and offers more than $100,000 in cash awards. American Flag Football League is one of the most innovative, fan-friendly and highly skilled leagues. The competition pits amateur teams against pro squads that include former professional athletes such as Michael Vick, Chad Johnson and Jason Avant. AFFL plays a 7-on-7, 60-minute game on a 100-yard field. First downs are made by moving past a marker every 25 yards. There is no kicking: kickoffs are replaced by throw-offs, and extra points are scored on run or pass plays, earning one, two or three points depending on whether the play is run from the 5-, 10- or 15-yard line. The AFFL has grown from a single pilot game in 2017 to last year’s season-ending U.S. Open of Football Tournament, featuring 36 amateur and pro teams. That event had its final 11 games broadcast on NFL Network, including the final, which was staged at BBVA Compass Stadium in Houston, home of Major League Soccer’s Houston Dynamo. A New Orleans-based amateur squad, Fighting Cancer, won the final and took home the $1 million prize. Despite what would seem to be the low-tech nature of flag football, the AFFL has shown that it is committed to high-tech advances. Impressive technology that the AFFL shows off during games including the use of SkyCam as the primary game camera and virtual on-field graphics that TV fans can view on NFL Network. The AFFL also has its unique Go Clock, developed by SportsMedia Technology, which provides a visual tool for officials to enforce the league’s two-second defensive rush and four-second quarterback ball-release rules. The Go Clock is positioned on the sideline, like a first-down marker, and emits a sound when time expires. There is also a Go Clock on-field graphic for TV viewers. But even in youth leagues with flags attached via Velcro, the benefits of the game are plain to see. “Not only is flag football safe, fun and affordable, it helps athletes develop hand-eye coordination and allows them to play football without the contact of tackle,” Meram said.